It only happens if I'm not logged in - once I'm logged in I can see the threads with no problem. It seems to be newer threads - ones from November or older are viewable when logged out, ones that are recent are not. This thread, for example, I can only see when logged in. Doesn't matter to me, I guess, since I do in fact normally log in, but if this is happening more generally, then for people who are not already members, it might discourage them signing up if they can't first take a look at recent threads? Hmmm. 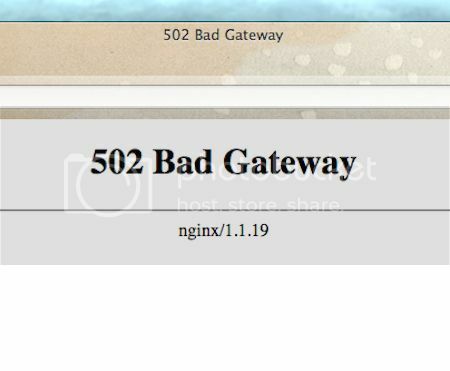 This might be a problem with my Firefox, as I just checked in Safari and could see the threads that get 'bad gateway' in Firefox. Maybe it's just me. I'll have some strong words with my computer. Also it's not just newer threads like I first thought, some old ones get bad gatewayed too. Grrr. It's Firefox. I get this happening as well trying to read newspapers online! OK. I tried googling the error message and found a load of techy forums about it but could not make any sense at all of the information! I seem to be having a lot of problems with foxes at the moment!